I think this is one of the most fun weddings I’ve seen – every detail was perfectly planned and the entire day was nonstop fun! 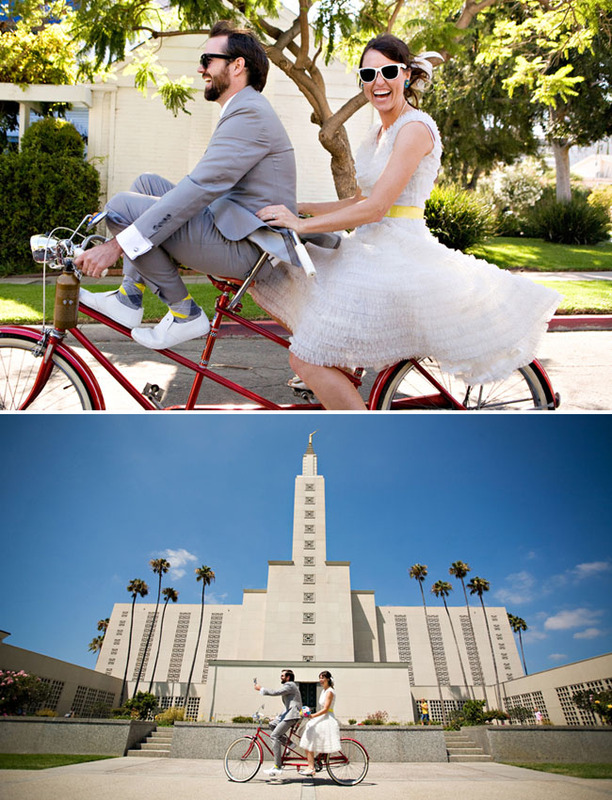 Rebecca + Derek had their wedding ceremony at the Los Angeles California Temple and followed it with a bike brigade across LA! 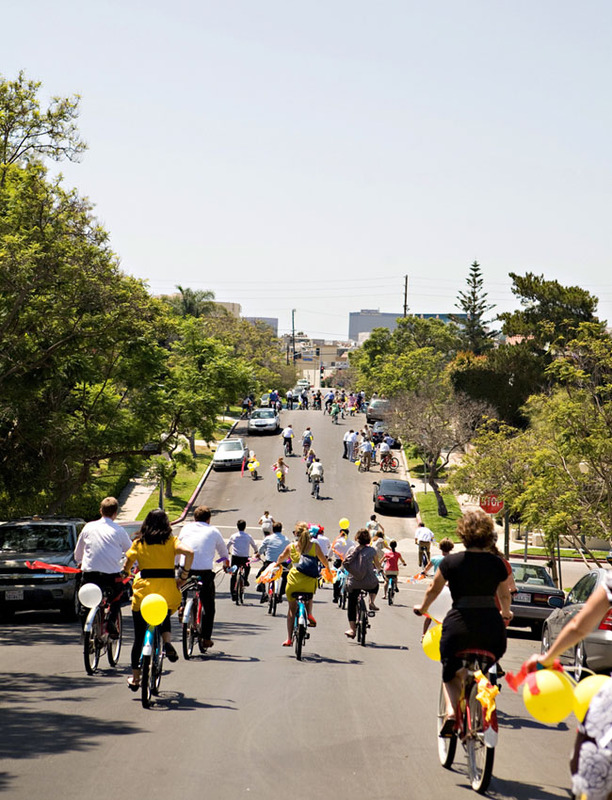 They biked to a park where a picnic was waiting for them along with Diddy Riese ice cream sandwiches. 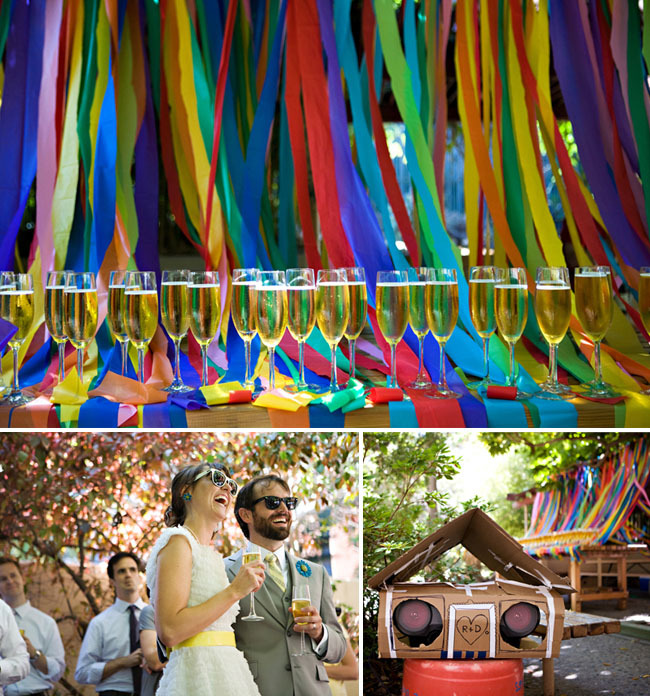 Then they walked through the botanical gardens at UCLA for toasts under a rainbow of streamers and ended the night with a reception at the Stagecoach Inn Museum along with the cutest mini golf course chronicling their relationship. Such an amazing fun day! Thanks so much to photographer Rachel Thurston for letting me share this wedding and big congrats to Rebecca + Derek for having a wedding that was truly one-of-a-kind! I ADORE Rebecca’s vintage 1950s gown she found at Timeless Vixen. She paired it with a yellow belt from Club Monaco along with a vintage headpiece and gold peep-toe slingbacks from J.Renee. The necklace is her grandmother’s and her brooch bouquet was made by herself from her collection of vintage enamel-flower brooches. The invitation informed guests to “dress to impress, but to wear comfortable clothing” that they could move in. They were also told to bring sunscreen and sunglasses, and that lunch would be served. 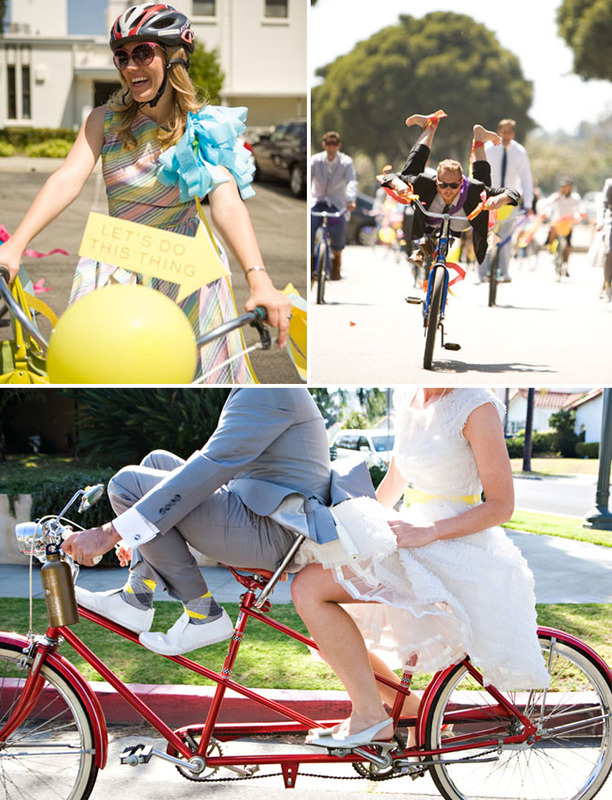 When the guests gathered near the church following the ceremony, they were surprised with bicycles and helmets (rented from Perry’s) in the parking lot. How incredibly fun is that??!! 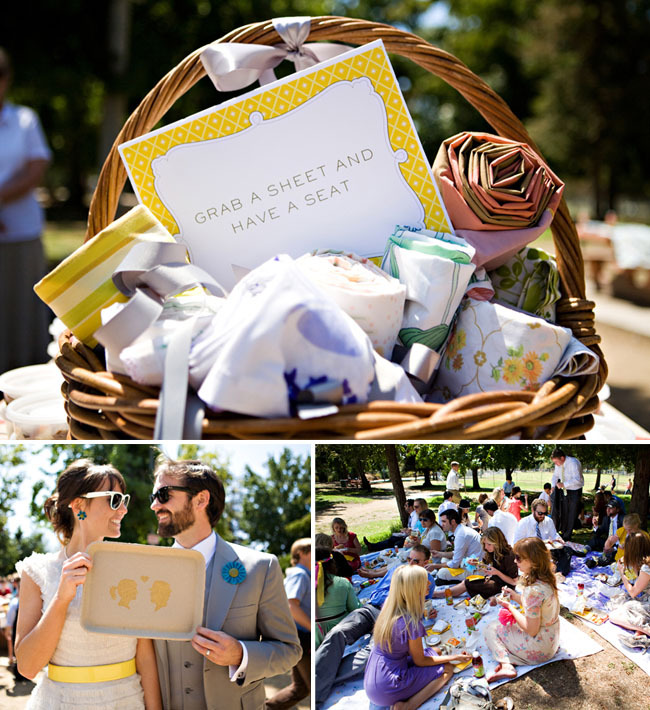 Guests followed the newlyweds through Santa Monica to Westwood Park for a picnic. After lunch, the group rode to Diddy Riese (if you live in LA you know this place – the super yummy ice cream sandwich shop in Westwood) for dessert. 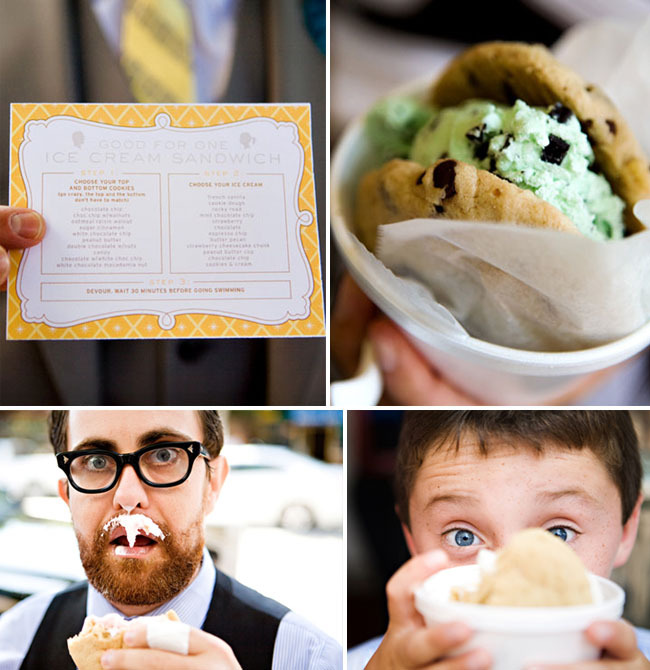 Each guest received a coupon for 1 ice cream sandwich – such a fun idea! The ride ended at Mathias Botanical Gardens in a small clearing. 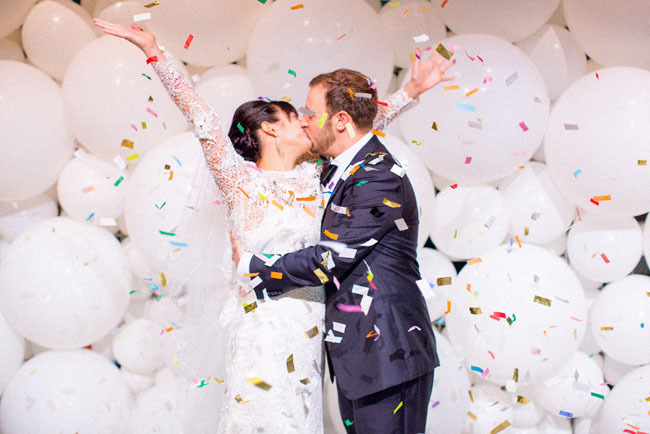 There Jordan Ferney, the day’s coordinator + friend of the couple, had set up a rainbow backdrop made from strips of plastic tablecloths. Glasses of sparkling cider awaited guests. 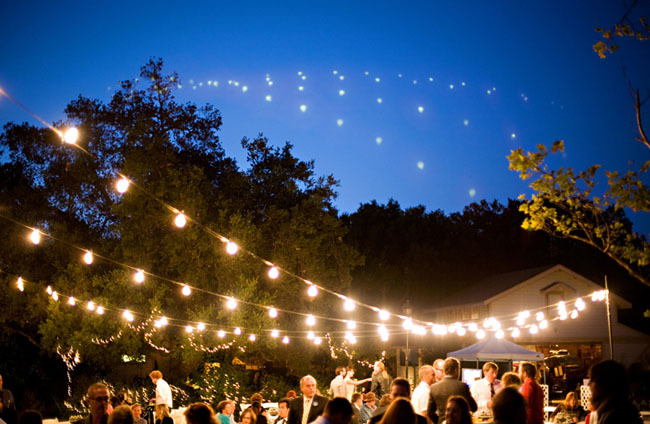 “It was a pretty magical sight when everyone entered this little clearing with drinks all set up and ready to toast,” Rebecca recalled. Derek’s brothers, a bridesmaid and two pairs of mutual friends gave toasts in honor of the couple. Rebecca + Derek had encouraged them to make their toasts more like presentations, so one included charts and graphs as visual aids, another included a bag of goodies to be used on various destinations on their Italian honeymoon, and the final performance was a musical number. 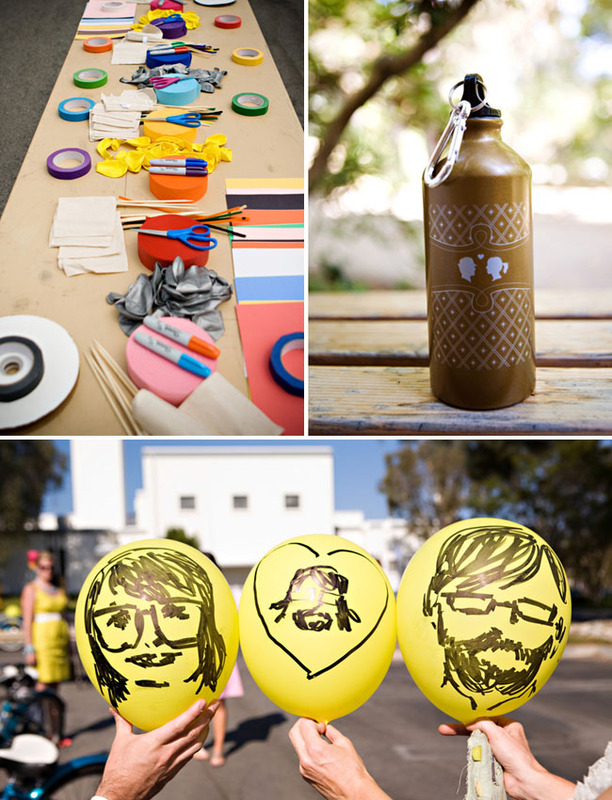 What a super fun idea!! Later in the evening, Rebecca + Derek hosted an open house for 200 of their friends + family at the Stagecoach Inn Museum in Rebecca’s hometown. Rebecca + Derek aren’t huge dancers, so they wanted to do something different. 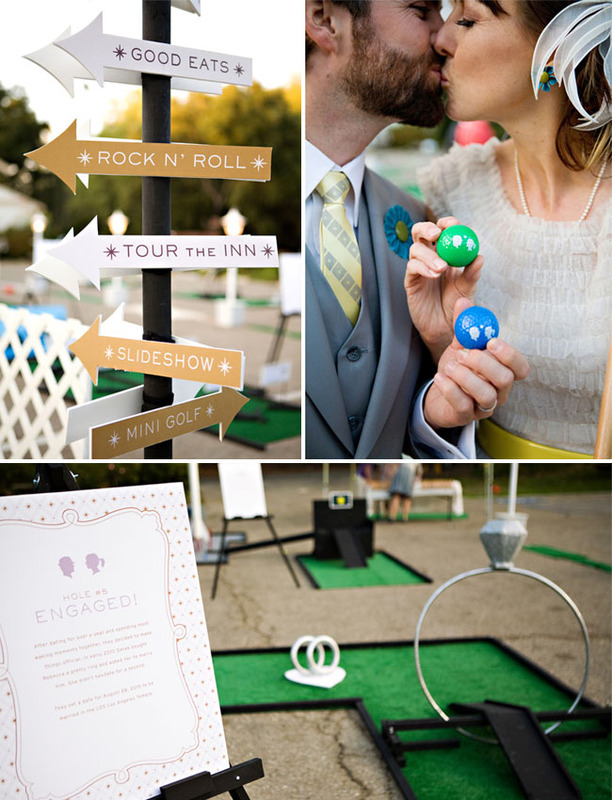 They came up with a mini golf course that told their story in a fun way for guests. Rebecca’s father build the course including the golf clubs! I also love the personalized golf balls they had made. 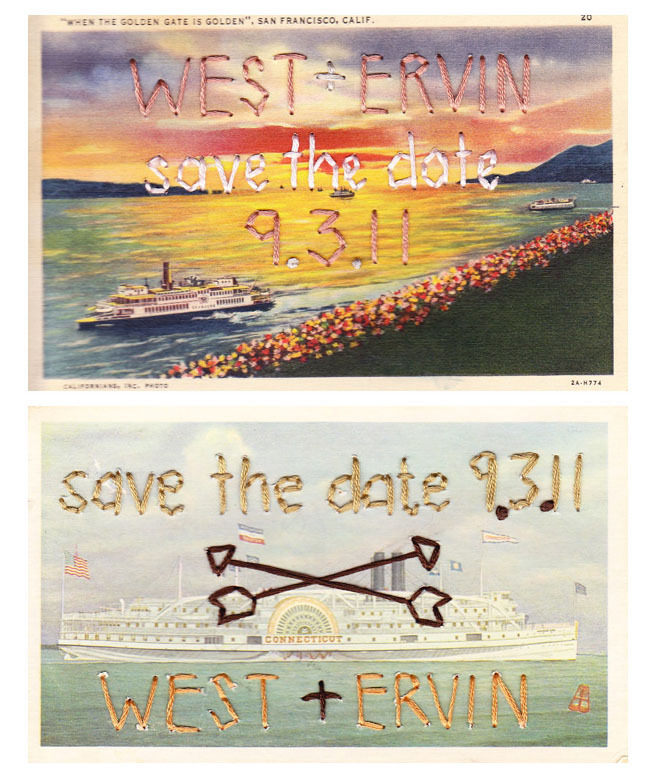 Cindy Ferguson, the couple’s friend, designed the retro-patterned invitation suite, created to look like a book. When you opened it up, a library card holder contained Rebecca and Derek’s engagement photo and special invitations to the day’s events. Jordan Ferney of Oh Happy Day! letterpressed the pieces and a group of friends helped assemble the components. What a fun magical day! 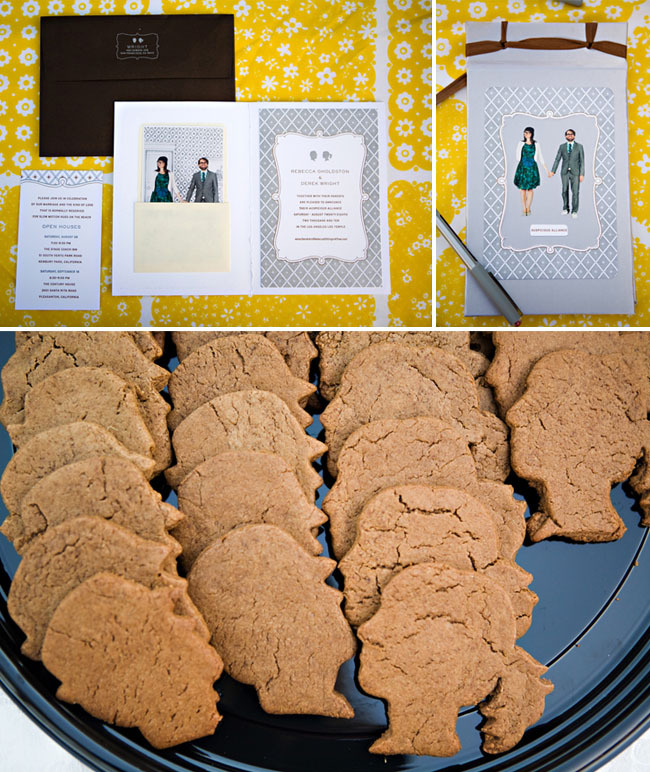 Their wedding was also featured on the Martha Stewart Blog, so be sure to check that out to read even more about their day. Groom’s Suit: Custom-made during a visit to Hong Kong. I’m curious to know where the signage was made? It has a contemporary/modern look that is really fun! This is so romantically unique! 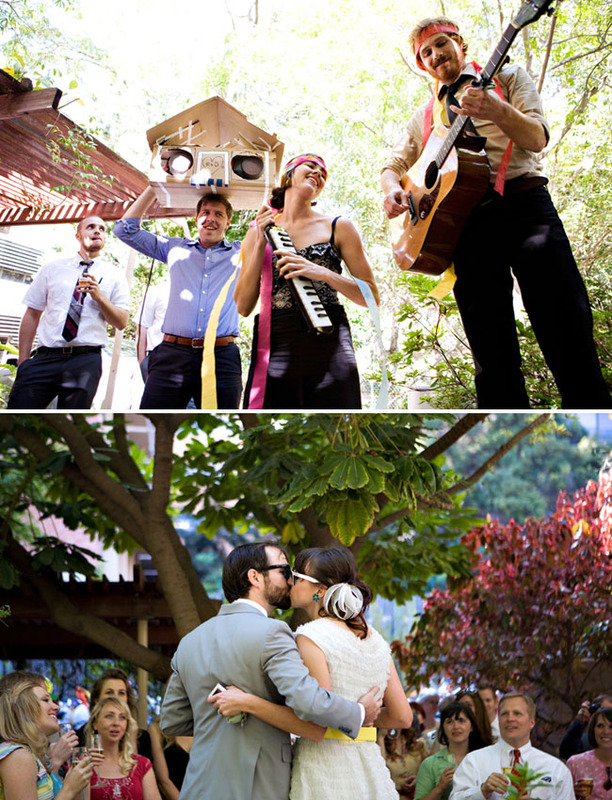 The photos show how happy this event was, and also the couples. Wow! 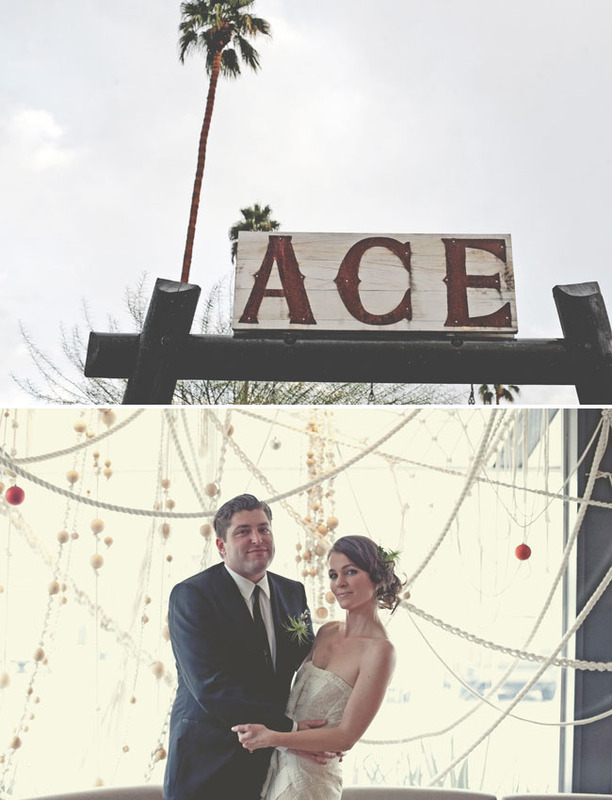 This is my favorite wedding so far this year…LOVE IT!!! 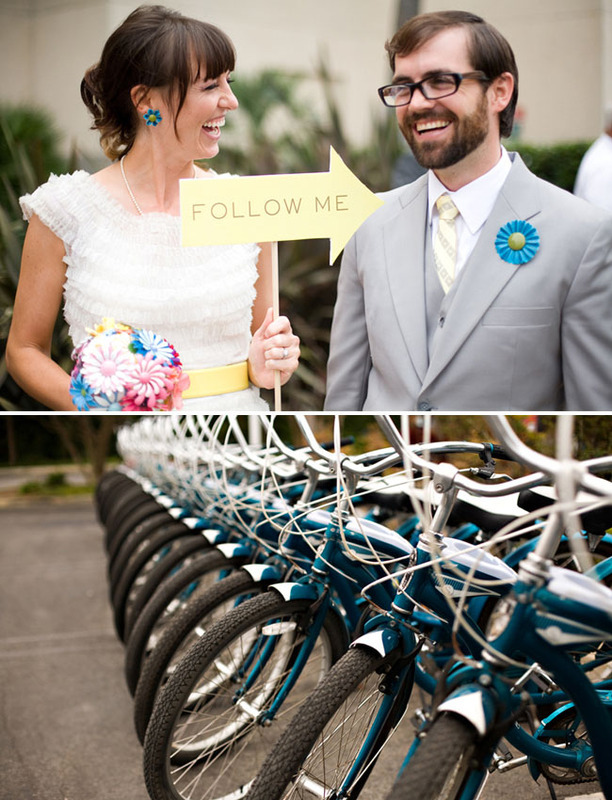 This wedding with bikes might be the best wedding I have ever seen! Love it! Man, I wish I knew these peeps! What an awesome wedding!!!!!!! Awesome wedding. 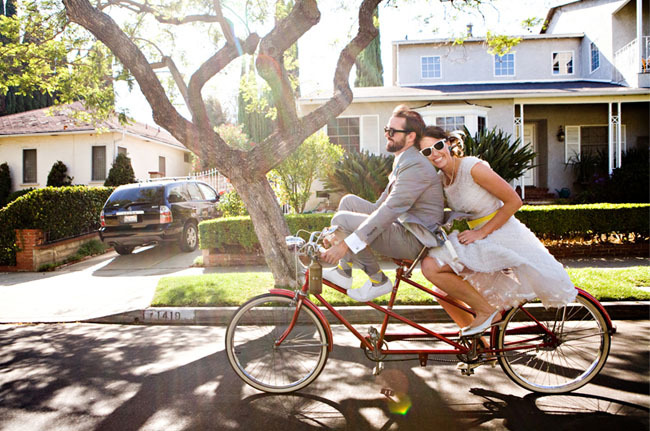 Riding bicycle on the weddind day is apsolutely incredible idea. 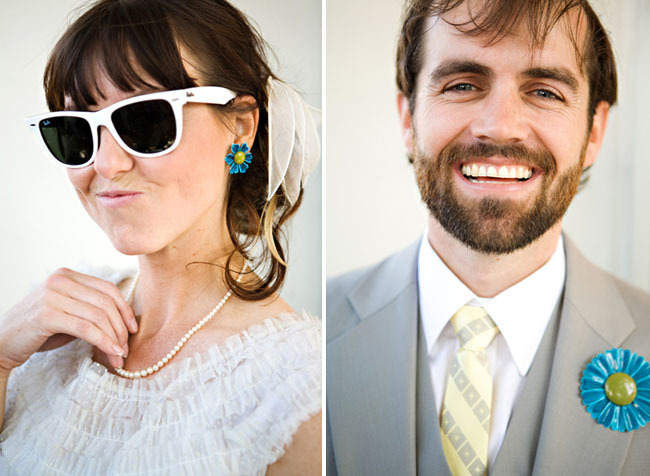 Here’s to a couple with a quirky side and not afraid to show it. Also kudos to all their friends for taking the ball and running with it, or make that taking the bike and peddling with it. 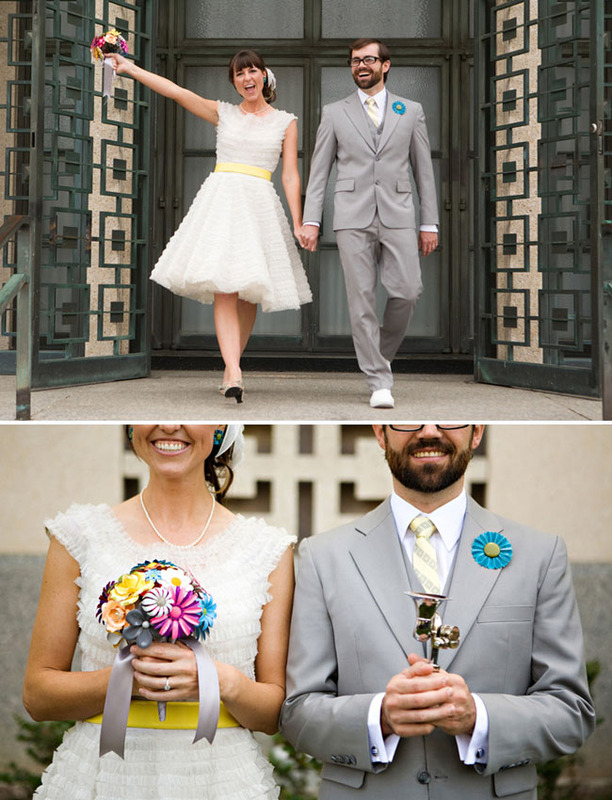 Adorable wedding, you can just see the sparkle in their eyes and the fun they had! 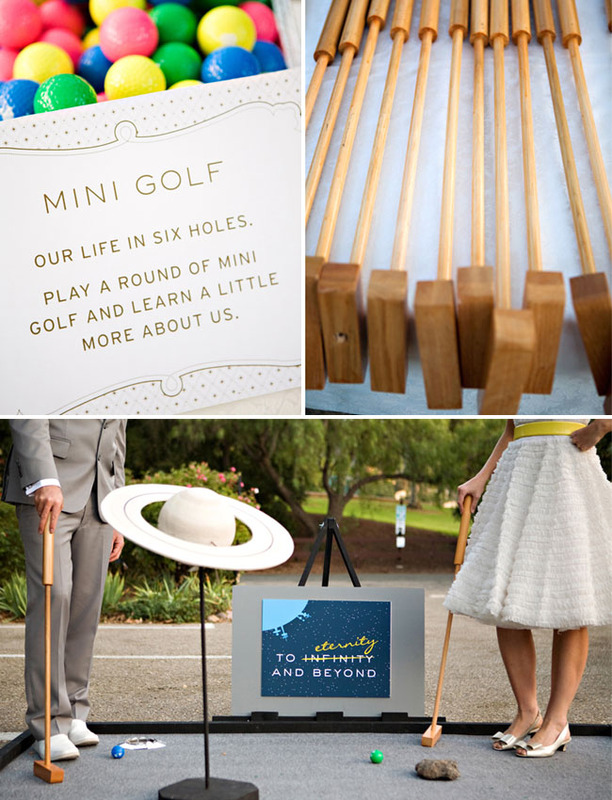 this is probably the cutest and most fun wedding I have seen!! OK, I don’t know this couple. But I seriously love them. What could be cooler than a bicycle group ride to your picnic in the park reception? How creative was the wedding planner that planned this wedding.. 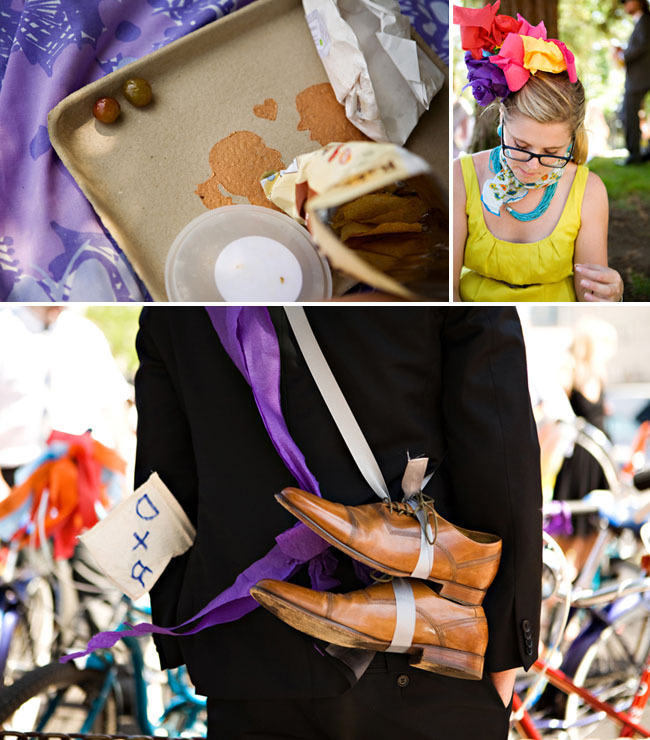 Totally love the photography..
That’s the most amazing, beautiful, colorful, creative, fun, cute, awesome marriage EVER! I cried rainbows! 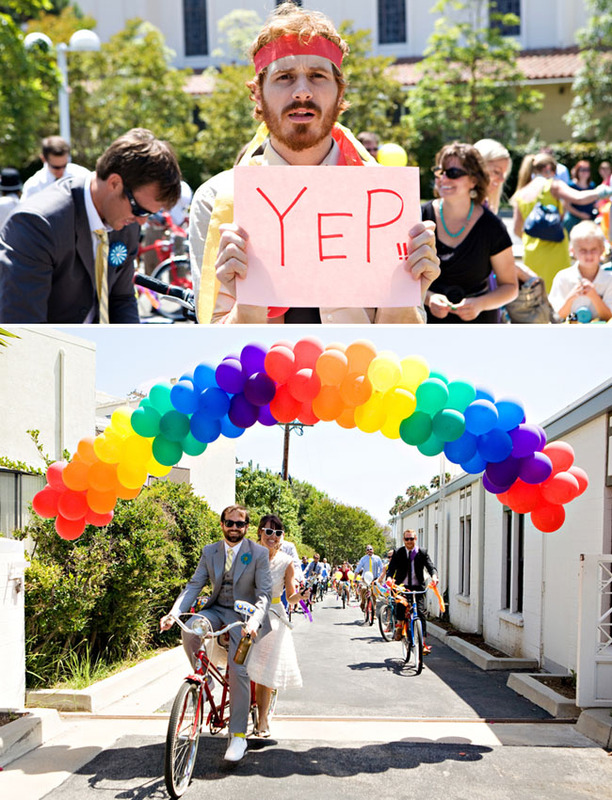 You may not agree with our concept of eternal families, but you have to agree: mormons marriages can be AWESOME! So great!! I am inspired, maybe for our 10th wedding anniversary next year :) Thanks for sharing your special incredible day. Spectacularly beautiful, so many smiles. delightful in every way! 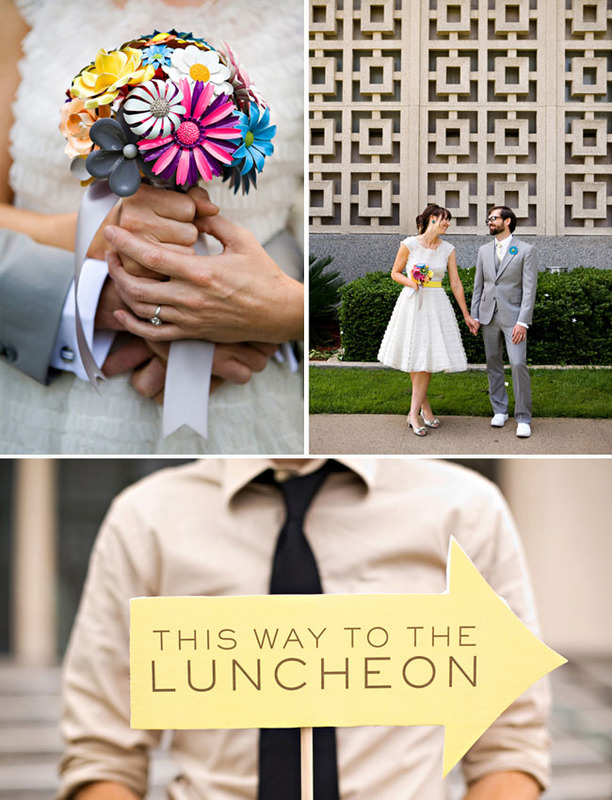 Pingback: Eye Flare For Sun Glare « David Tutera Wedding Blog • It’s a Bride’s Life • Real Brides Blogging til I do! Looks like total fun! Have a great life together. This wedding doesn’t look like it could get any better! And this couple looks like they are a serious amount of fun! And the colours, so bright and vibrant! I love everything about it! Thanks on your marvelous posting! I definitely enjoyed reading it, you will be a great author.I will make certain to bookmark your blog and will often come back sometime soon. I want to encourage you continue your great work, have a nice morning! Crazy idea but a fun one though.